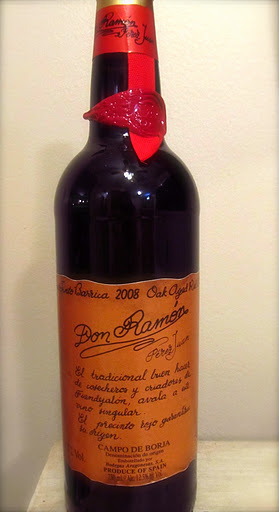 My sister came over with a bottle of Don Ramón Vino Tinto Barrica 2008, and was all fired up about it because she said it was not only stellar but also incredibly inexpensive. As I am a lover of fantastic, budget-friendly wines, I straightaway popped it open. Gorgeous ruby garnet in colour, aromas of peppery raspberries whilst faint, were alluring. The medium body was like a yummy piece of jammy berry pie melting in your mouth. Juicy raspberry and slightly tart cherry flavours melded seamlessly into the smooth oaky finish that culminated with wisps of smokiness. This bottle doesn’t over-extend itself trying to be complex, rather its focus is on simple, well-constructed flavours. The result is a fun, easy drinking glass that keeps you reaching for more. Delightfully very much the same as the 2008 vintage, with the addition of a bit more jammy berry flavour and cedar notes on the finish. The smokiness of the 2008 is less noticable, but I think it will develop in another year or so. thanks for the kind words, i'm glad you enjoy it! sláinte!